Posted on Thursday, June 20th, 2013 at 1:18 am by Ty Anderson. Life as a cynic is great. In the case of Office for iPhone I was right! You can say I was only half correct due to the fact Office for iOS only supports the iPhone. If you made this argument to me, I would listen to you… patiently. Then I would tell you, you don't understand the situation. Microsoft if fighting a multi-front war. They can't simply release Office for iOS and have it support both the iPhone and the iPad. If they did that it would kill the Surface tablet. That makes Office for iPad a non-starter… for now. I thought this over for a few days. 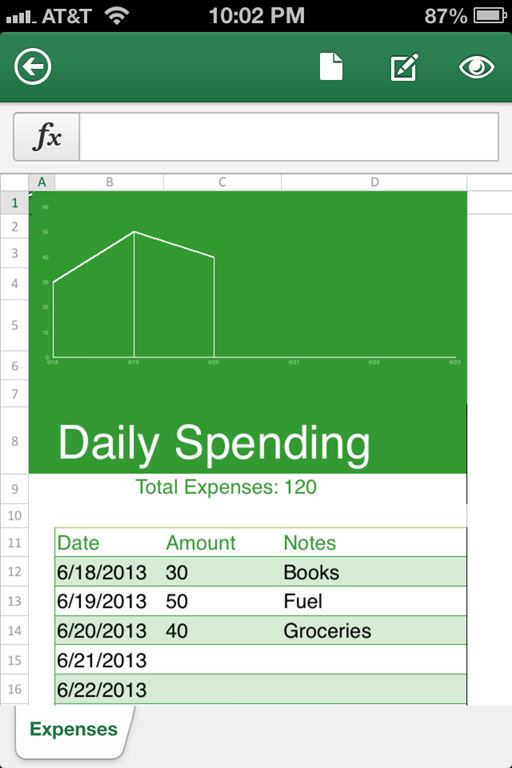 I have decided not to focus (too much) on the shortcomings of Office for iOS. The fact that it exists is huge! Microsoft is a software company and I'm happy to see them embrace this fact. Does this release work the way I do? No, it does not. That's okay. It's a start and I'm sure I'll adjust. But this drama has only begun and it is who knows how it will play out. Microsoft's competitors have lots of cash and the will to inflict pain. Heck, Apple is set to release a web version of iWork. I took a look, it was easy to use. It could be trouble. In their near term, Google should be scared. In the long-term, should Microsoft? Maybe. For now, let’s answer some other questions. The recent files list syncs with SkyDrive and shows the recent files I have accessed across all devices. 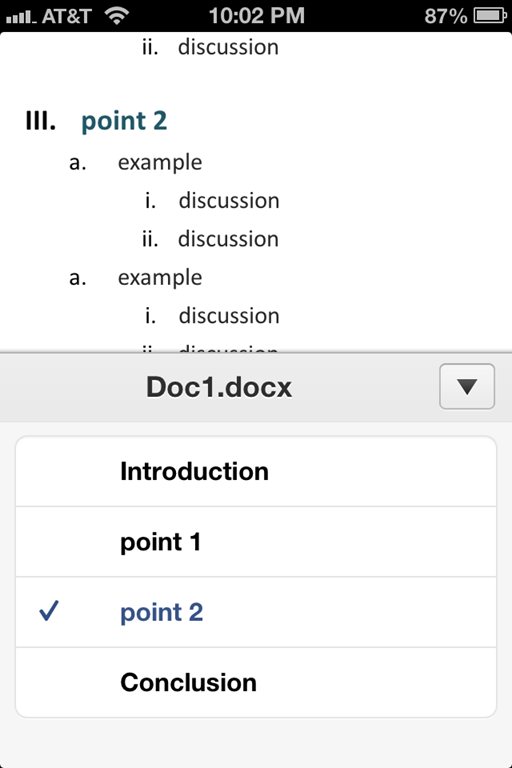 Word provides an outline view that allows for quick navigation within the document. If only the Word web app had this feature! 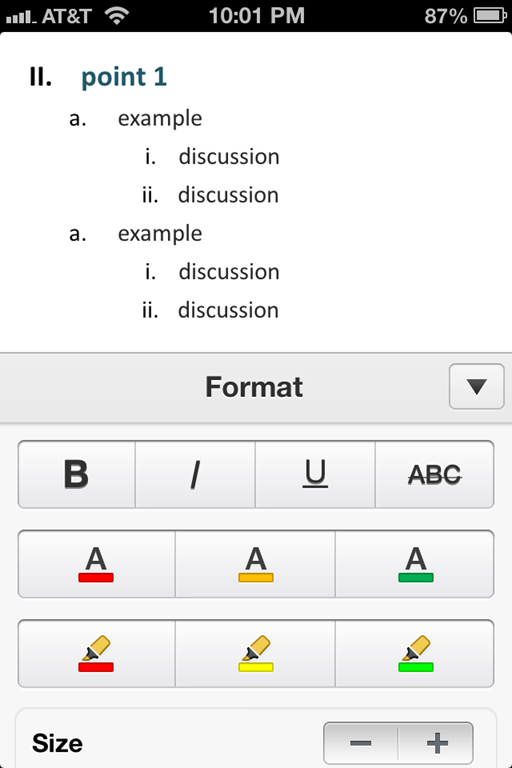 Review: Microsoft Office Mobile for iPhone :: From Lawyers Using iPhones. Real professionals with opinions. A video review :: from woman in technology at site called TechnoBuffalo. I like their production quality. This is a good video. How does one obtain it? Easy… you use your iPhone to visit the Apple App Store and you download it. It’s free. But, it will not do you any good unless you have an Office 365 subscription. This means it will cost you at least $100 to use the app. Advantage to apps like QuickOffice, DropBox, and GoodReader (among others). But, maybe there is a way around the subscription limitation? The above item is clever, if not obvious. But, I had not thought to try it. 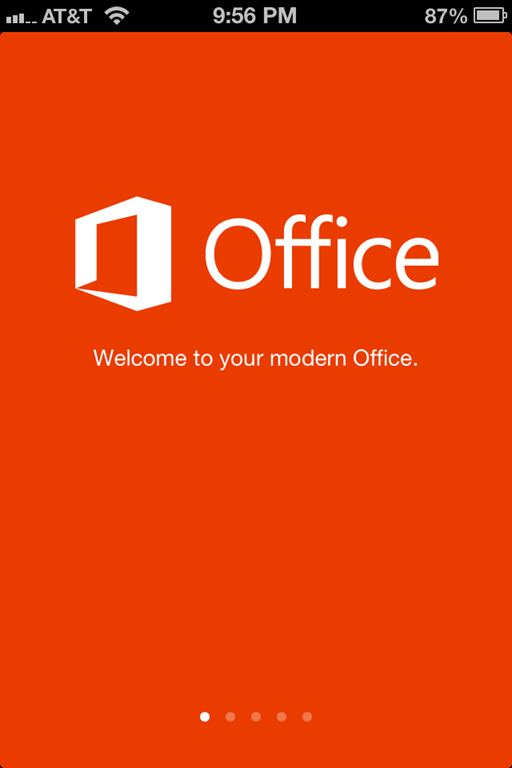 Office for iOS… too little too late? 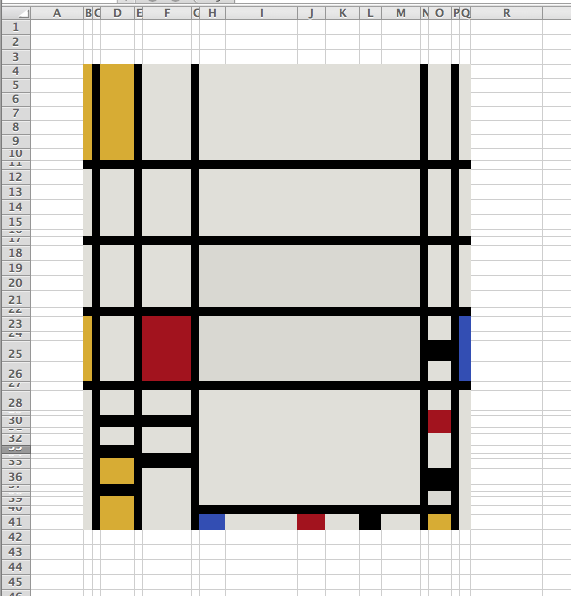 It comes down to personal workflow. Thus, it is a personal question. I’ll share my thoughts after these items. 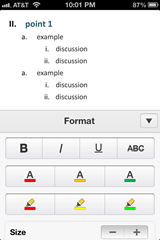 Microsoft Office on the iPhone: Has it arrived too late? 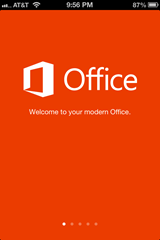 CloudOn CEO: Office Mobile for iPhone is ‘half-baked’ :: Consider the source on this one. I’ve tried CloudOn… talk about half-baked. Sheesh. 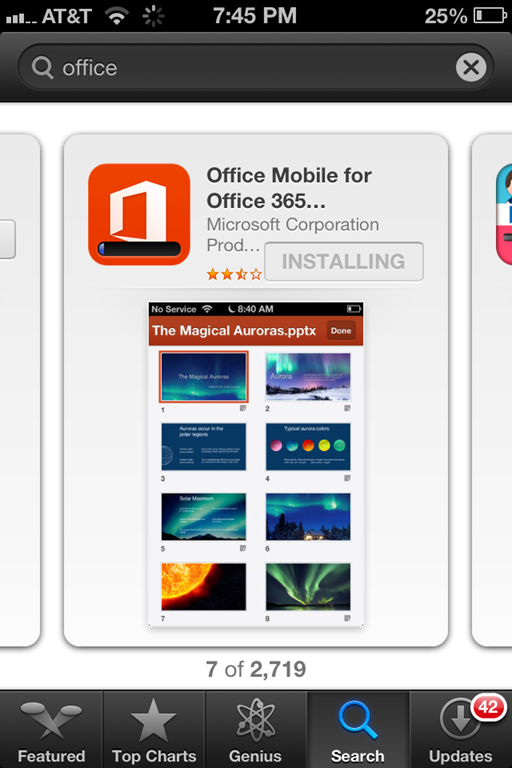 All mobile apps should require a subscription like Microsoft Office for iPhone :: Not is it not too late, heck… MSFT is the standard bearer for how mobile revenue models should work. I love techie journalism. I am now entrenched with Dropbox on Desktop and laptop. This is because DropBox is easy to use and works well with both Windows and Mac. I have reasons for using both. But SkyDrive is coming along and we continue to see Microsoft committing to ensuring their software works well on multiple platforms. Maybe I’ll change to SkyDrive exclusively. Little things like remembering my recent files make a big difference to my workflow. Where does this app fit in? The fact that you can create Word and Excel files is probably a bonus that will rarely be utilized. The fact that it is tied to an Office 365 subscription solidifies this app as a “deal sweetener”. It’s a nice-to-have component of Office 365. Send file links for files in my locations (SkyDrive, Office 365 SharePoint, SharePoint) – Dropbox makes this easy. Mulitple account support – I have more LiveID (aka Microsoft Accounts) than I should. I’d like the ability to either combine them all or add them all to the app. Currently, Office for iOS only allows for a single SkyDrive account. 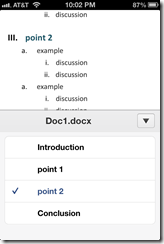 OneNote support – I know there is a separate iOS app for OneNote. I’d rather have OneNote included in this app. It centralizes my Office content and removes an icon from the iOS screen. I don’t think Linked Accounts is the answer I’m looking for.